The South Korean in-vitro diagnostics market is expected witness a CAGR of 5.4% during the forecast period. Certain factors that are driving the market growth include the high prevalence of chronic diseases, increasing use of point-of-care (POC) diagnostics, advanced technologies, and increasing awareness and acceptance of personalized medicine and companion diagnostics. According to the Ministry of Health and Welfare, chronic illness accounts for the majority of ailments in South Korea, a condition worsened by the health care system’s focus on treatment relatively more than prevention. South Korean adults run the risk of chronic diseases due to an unhealthy diet, a report from a state-run agency showed. According to the “Public Health Weekly Report” published in 2018 by the Korea Centers for Disease Control and Prevention, Koreans eat much less than the recommended daily intake of nut and seeds, calcium, milk, vegetables, and fruits. On the other hand, they eat much more than the recommended amount of red meat, processed meat, and sugar-sweetened beverages. As per the scope of this report, in-vitro diagnostics involve medical devices and consumables that are utilized to perform in-vitro tests on various biological samples. They are used for the diagnosis of various medical conditions, such as chronic diseases. 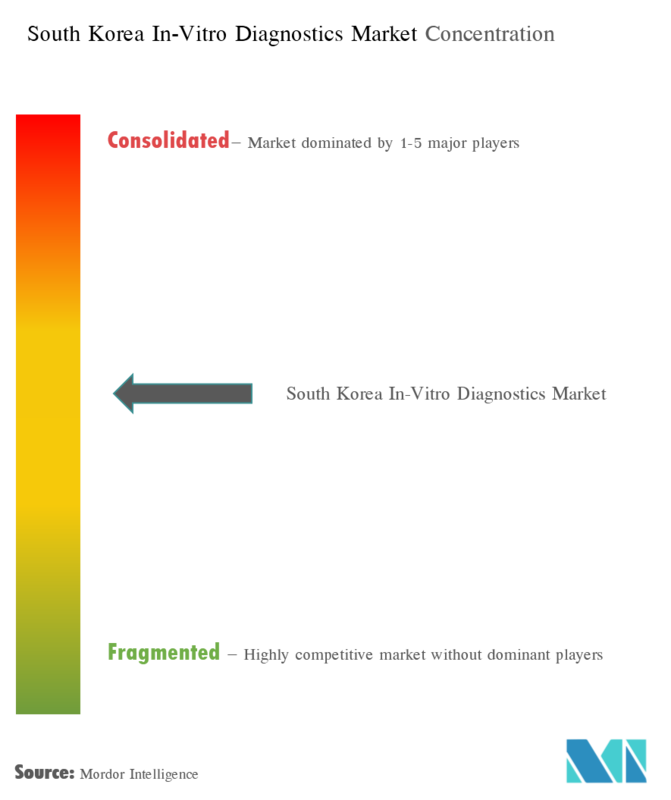 The reagent segment of the market studied includes chemical, biological, or immunological components, solutions, or preparations intended by the manufacturer to be used during the in-vitro diagnosis process. Because of the high cost of many diagnostic platforms, it is common for manufacturers to lease equipment instead of selling technology outright to end users. In these arrangements, the lease is tied to contracts to purchase associated reagents or assays for the equipment over the life of the contract. Many diagnostic companies have an excess of 75% of sales from consumables, such as assays and reagents and such agreements guarantee the generation of cyclic revenues associated with the sale of reagents and other consumables. 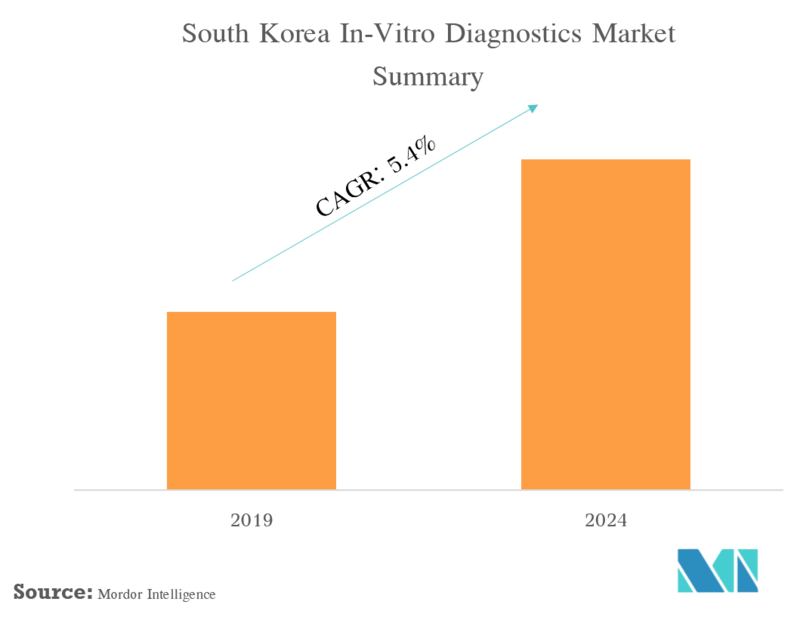 The South Korean in-vitro diagnostics market is highly competitive and consists of a number of major players. 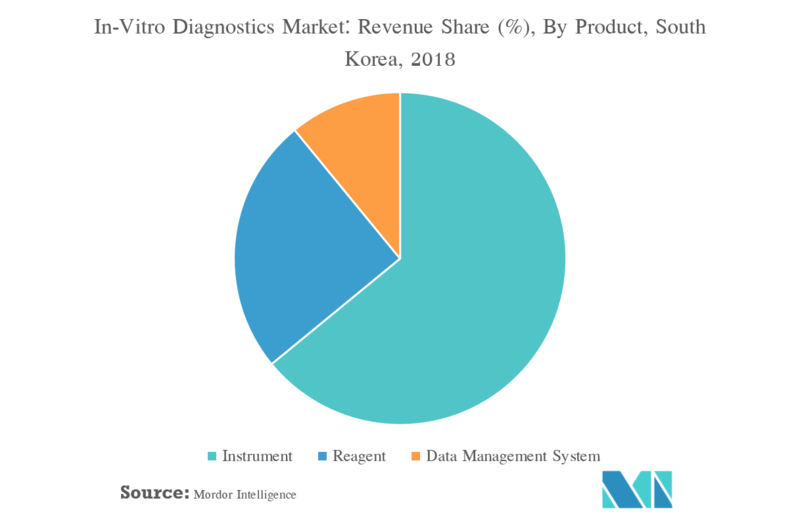 Companies like Abbott Laboratories, Becton, Dickinson and Company, Bio-Rad Laboratories, Inc., Danaher Corporation, Johnson & Johnson, Roche Diagnostics, Siemens Healthcare, Thermo Fisher Scientific Inc., among others, hold the substantial market share in the South Korean in-vitro diagnostics market. 6.1.8 Thermo Fisher Scientific Inc.